Google+ is already popular enough and doesn't need any introduction. 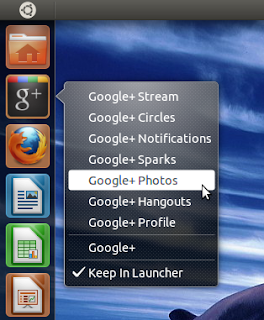 Here is how you can add a Quicklist for Google+ in your Unity Launcher for easy access to Google+ services. Right click the image/icon below and save it into '.local/share/icons' of your home directory. You might need to press Ctrl + H to see the hidden files and directories. A Google search will return hundreds of results. Preferably, choose 64x64 pixels as the image size. Then just save your favorite icon to '~/.local/share/icons' and edit the "Icon=google-plus.png" section from the code above to whatever the name of your favorite icon is. Now, open your home directory and press Ctrl + H to see the hidden files. 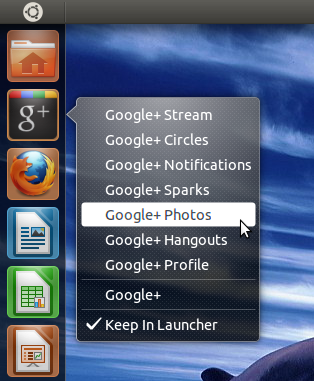 Navigate to '.local/share/applications' and drag and drop the newly created file 'google-plus.desktop' into the Unity Launcher.